Offline Credit Card Processing allows store owners to process credit card orders offline by accepting the credit card information and splitting the card number into two parts; partial save to the database while the rest e-mailed to the store owner. Please see the Plugin FAQ for additional information. Looking for support, a copy of the readme, Plugin updates, Ideas or usage instructions? 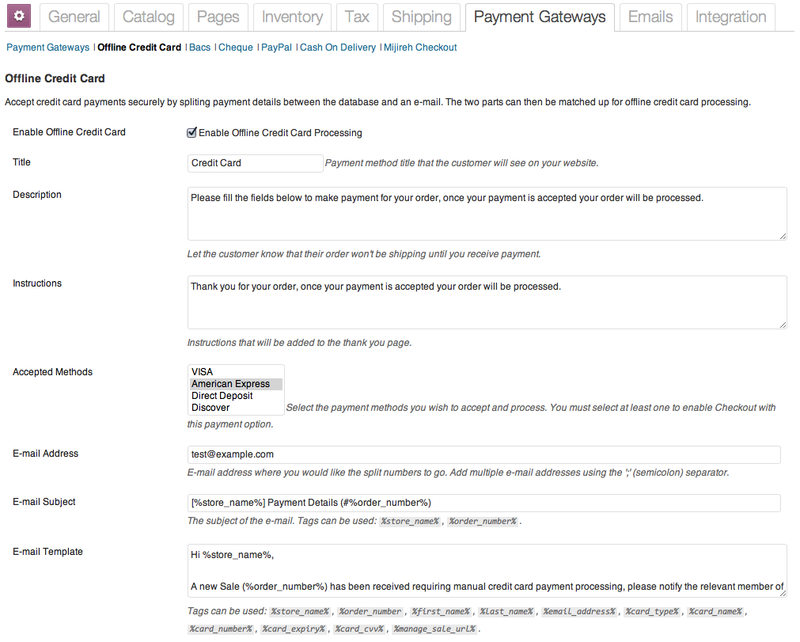 Check out our Documentation for Offline Credit Card Processing. There is no mention of the PCI compliance for the plugin, so is it PCI compliant in conjunction with SSL? Hi Peter. This Plugin is not a PCI compliant solution and includes a disclaimer to this effect. No complete card details are stored meaning the Plugin is not bound by PCI compliancy regulations though as a store owner you are highly encouraged to secure your WordPress store as well as mail server for processing offline payments as you would with any e-Commerce solution. Our email server went down, how do I get the system to resend the confirmation email with the last 4 digits of the credit card info? Help!! Hi Adman, you should contact your hosting provider or e-mail server administrator. Our Plugin does not cache sensitive card details so it is either in your Inbox queue still to be delivered or you will need to re-capture those missing card details by contacting the affected customers. Hello we need this plugin, payed for the opencart one but it doesn’t work with our web store host Shopify, Do you think this could ever work with shopify? or will we indeed need to move hosts? Shopify already has SSL built in to its system. Hi Jonathan, Shopify is a hosted e-Commerce solution which has the downfall of only supporting Plugins/extensions that Shopify offer. You will need to migrate your store to a self-hosted CMS (e.g. 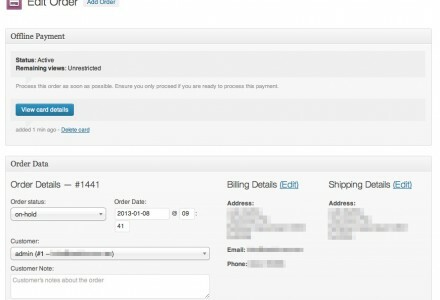 WordPress using WP e-Commerce or other e-Commerce Plugin) to use our offline payments Plugin. The same applies to the opencart extension you’re likely referring to. We can assist you in migrating and organising SSL support for your new or existing domain, please get in touch if we can assist further. Hi Jonathan, I’ve done some reading on how we could list an OCCP App via Shopify.com which would mean you wouldn’t need to change e-Commerce platform, I’ll continue exploring this option, someday soon we might support Shopify! 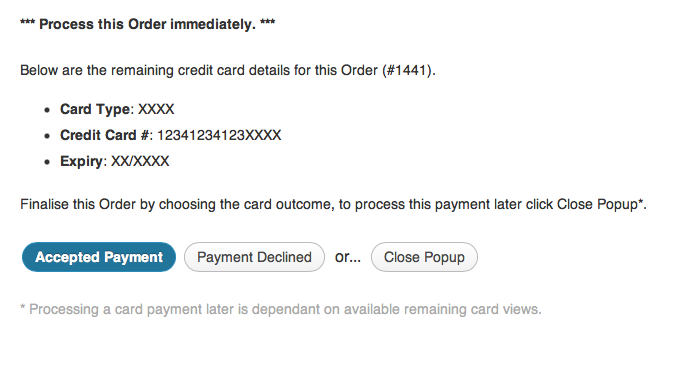 I’ve got an idea – could you by any chance put the total for the order in either the email or the card info page? That way when you’re entering the details you don’t need to click on ANOTHER window to get the total. Also, I think it would be cool if there were an option for having the “Accepted” button on the credit card details page make the order “Processing” instead of “Complete” – just ’cause “complete” for me (and perhaps others?) means it has been shipped, not just “payment received”. Hi Michelle, thanks for raising these as suggestions. I’ll add a new tag for the Order Total to the e-mail and add an option to the Setting screen to show/hide the Order Total amount from the card info popup (defaults to show). Regarding the Accepted button, I’ll add an option to control what this button does. It makes sense for stores (like yours) to have control over this. I’ll get these into the next Plugin update. Have been using this plug in since July and it was working great. Client just called and said they are no longer receiving emails with additional credit card information. 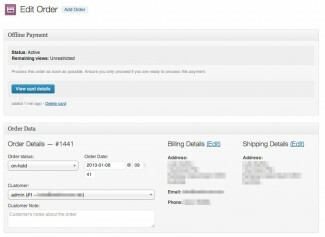 The order portion on the back end still has credit card info, but the emails have stopped. I am interested in using this plugin but when clicking on the documentation section link I am getting a page not found. I’m interested in looking at hte readme, etc. 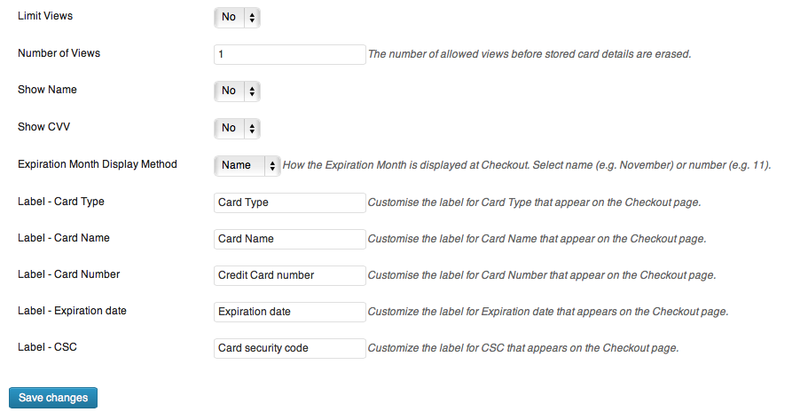 Also, (and this may be answered in the documents) is the plugin doing any sort of simple credit card validation? Thanks. Hi Jeff, thanks for raising this. I’ll scan the site for broken links this weekend, we’ve been rapidly expanding the site so some 404’s have crept in. To answer your query, we do support simple credit card validation in the form of card number length based on the chosen Card Type. We’d like to extend this validation further by integrating with a compatible card validation solution/service. Thanks for the quick response. I figured that if the theme were WooCommerce-compatible, then your plugin would probably work. But…better safe than sorry! Does this work with WordPress 3.4 with Woo’s Capital theme and woocommerce1.5.8 plugin? Would this work for themetrust GATHER theme? Sure will Mark, looks like a great theme! I’ve had a play with the demo and it all looks perfect to tie in with our Plugin. When I view captured card details via wp-admin, most of the details are X’d out like in the example below. Running latest version of OCCP (1.7.6) and version 3.3.1 of wordpress with latest version of WPEC (3.8.8.3). Hi jwphillips, thanks for raising the de-activation error, I’ve patched this in the next Plugin update. As for the partial card details appearing within the popup, you need to link them up to the e-mail sent to the store owner along with the Admin Report/Purchase Receipt. 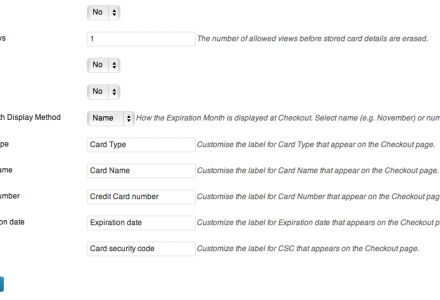 No complete card details are stored in the WordPress database. Is this 100% PCI compliant? Hi Chris, this Plugin is not a PCI compliant solution and includes a disclaimer to this effect. No complete card details are stored meaning the Plugin is not bound by PCI compliancy regulations though as a store owner you are highly encouraged to secure your WordPress store as well as mail server for processing offline payments as you would with any e-Commerce solution. I am loving this plugin, Michael, works great! I’m hoping you can check into whatever the “small changes” are to the code to take advantage of the ability to have sequential order numbers. Getting errors that takedown the entire site until the offline credit card plugin is removed via FTP. Are you aware of this and/or is there an compatibility update coming? Hi Cory, thanks for the heads up. I’ll confirm compatibility today and release an update to resolve this. Hi Barry, feel free to get in touch as I’ll need to know more details about the card format to assist. There’s a filter ‘woo_oc_return_payment_options’ attached to get_payment_options() function which allows web developers to add additional card types to the Card Type dropdown at Checkout. Hi jewelrygal, thanks for the heads up. Patched in the next minor Plugin update. This has been fixed in the latest Plugin update. Great so now we are giving shop owners who may or may not have an SSL, who may or may not follow WordPress best practices and who may or may not even be legitimate merchants the ability to save senstivie information inputted on a non PCI-DSS complaint plugin. So before long either someone will hack this and gain card numbers or some rogue shopowner will start scamming the heck out of innocent shopgoers. I can’t understand, as a plugin developer, why this plugin was developed. It opens a ton of security issues that may or may not have a good answer. For the time being, strongly recommend against purchasing this plugin. Hi Chris, thanks for your feedback and suggestions regarding SSL enforcment, this was raised in the WP e-Commerce release of OCCP and the idea was to display a prompt to recommend the enabling of secure communications at Checkout. GetShopped have made this easier to impliment as they sell a SSL-‘setup’ Plugin which automates the purchase of an SSL certificate and installation, I will look into whether this is also applicable for Jigoshop. There is strong demand for allowing Jigoshop store owners to process credit cards via their instore merchant facilities, also, existing offerings are readily available for all other major e-Commerce platforms. As answered in your other thread no sensitive detail is stored in the database and any partial card details are deleted on successful processing of the Sale. I welcome any feedback or suggestions to improve this Plugin as well as tips for securing Jigoshop. This allows us to process the card offline using a separate software that we already have, correct? Yes, Offline Credit Card Processing (OCCP) collects the card details from the customer at Checkout and presents it to the store owner to process via their in-store merchant facility or virtual card processor. So we get the information we need in an email, and process it from there? That’s right, non-critical card details are partially stored in the WordPress database with the remainder sent via e-mail to the store owner. You cannot store or e-mail complete card details, card details are split between the WordPress database and the store owner e-mail notification. Does it allow for e-mails to be sent out saying that the order's been taken, and we'll follow up? If you are using WP e-Commerce you can customize the standard Purchase Receipt to include a prompt that you’ll follow up with the customer shortly. 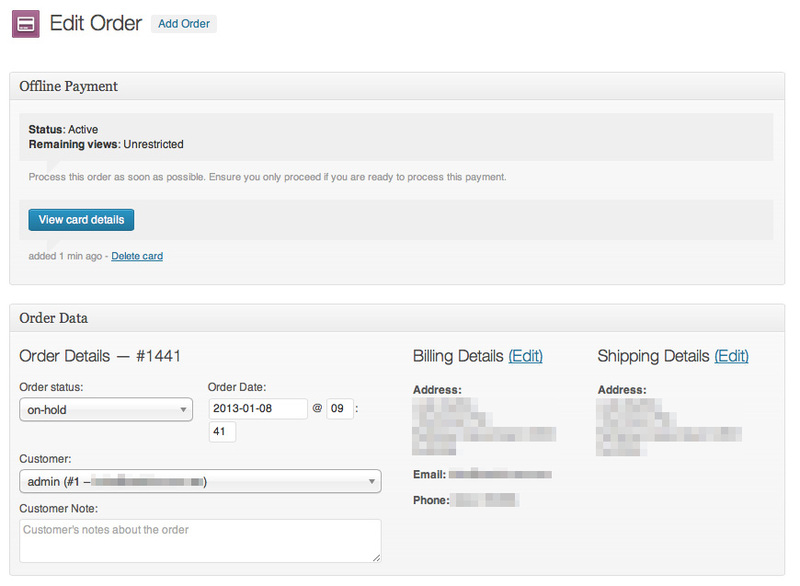 You can find this under Settings > Store > Admin > Purchase Receipt within the WordPress Administration. 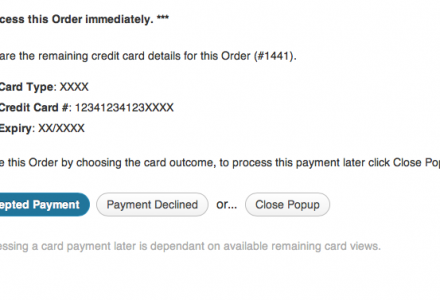 For Jigoshop and WooCommerce you can customize the message displayed at the Order Received screen and confirmation e-mail via Settings > Offline Credit Card and/or Jigoshop/WooCommerce > Settings > Payments > Offline Credit Card screen. If I'm just running SSL certificate on the host will this be secure enough? We recommend store owners using OCCP to deploy a valid SSL certificate at Checkout as well as within the WordPress Administration. Further, since OCCP e-mails partial card details to the store owner (or a preferred e-mail address) we recommend creating a unique e-mail address and limiting access to it (e.g. payments235442@storename.com. Is there any other way to ensure the credit cards will be processed securely? If my WordPress website is hacked will there be any chance of the customer’s credit card details accessed by 3rd party? 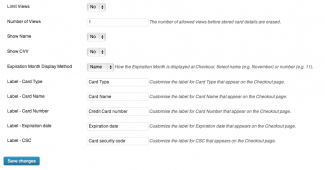 OCCP does not store complete card details in the WordPress database, since no complete card details are stored in the database risk is limited. To further limit risk once an Order is charged those stored partial details are erased from the WordPress database. We also recommend store owners to introduce a policy of also permanently deleting the e-mail with partial card details sent to the store owner once an Order is successfully charged. Offline Credit Card Processing comes with a Quick Start document (readme.txt) to help with installing the Plugin. Additional support can be found from the Contact page or methods below. If you find yourself needing immediate support for your purchase use the Premium Support page. If you have any problems, questions or suggestions please join the members discussion on our Offline Credit Card Processing forum. 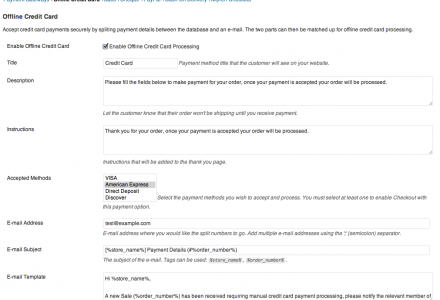 This Plugin allows a WP e-Commerce store to process credit card offline by accepting and storing credit card information until the transaction is processed. This process is done by spliting sensitive credit card details between the database and an e-mail to the store owner, once a transaction is processed database details are erased. 1. Upload the folder 'wp-e-commerce-offline-credit-card' to the '/wp-content/plugins/' directory. * Activating Offline Credit Card Processing for WP e-Commerce will add a new payment option under your available Payment options within WP e-Commerce. This plugin is under a commercial license and not to be freely distributed, not to be copied or resold. This Plugin allows a Jigoshop store to process credit card offline by accepting and storing credit card information until the transaction is processed. 1. Upload the folder 'jigoshop-offline-credit-card' to the '/wp-content/plugins/' directory. * Activating Offline Credit Card Processing for Jigoshop will add a new payment option under your available Payment options within Jigoshop. 4. If the card is successfully charged click Order Approved otherwise Decline Order to cancel Order. This Plugin allows a WooCommerce store to process credit card offline by accepting and storing credit card information until the transaction is processed. 1. 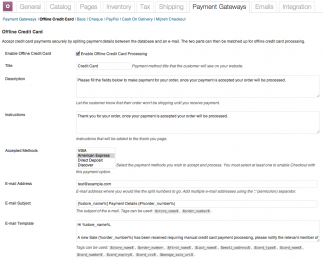 Upload the folder 'woocommerce-offline-credit-card' to the '/wp-content/plugins/' directory. 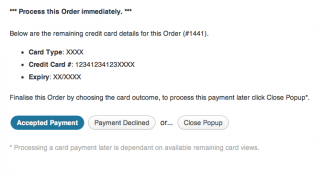 * Activating Offline Credit Card Processing for WooCommerce will add a new payment option under your available Payment options within WooCommerce.